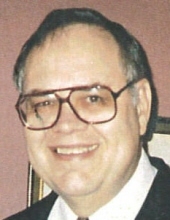 Edward H. Bullwinkel age 76 of Atlanta passed away Saturday March 30, 2019. He was a loving husband, father and grandfather who will be greatly missed. Mr. Bullwinkel, originally from Charleston, S.C., was an alumni of Georgia State University. While at Georgia State, he earned 2 Associates Degrees and 5 Bachelors Degrees. He is survived by his wife, Nancy Bullwinkel; step-sons, David Orton and Rick Orton; step-daughter, Linda Callison; brother, Don DuPre Lewis; granddaughter, Samantha Orton; grandsons, Nicholas, Liam and Ben Orton. A Memorial Service for Mr. Bullwinkel will be held on Saturday, May 4 at A. S. Turner and Son’s from 4:00 to 6:00 with the Service at 5:00. To send flowers or a remembrance gift to the family of Edward Henry Bullwinkel, please visit our Tribute Store. Guaranteed delivery before Edward's visitation begins. "Email Address" would like to share the life celebration of Edward Henry Bullwinkel. Click on the "link" to go to share a favorite memory or leave a condolence message for the family.